Travis Scott’s third project in three years comes 363 days after the release of his debut studio album Rodeo, and the time taken in between indicates that the vast majority of the tracks included on this album are little more than Rodeo B-Sides — in fact, “Wonderful”, a track released last December and marketed exactly in this way, inexplicably serves as the album’s closer. Many of the tracks here seem to come from the same musical state of mind, although with ideas and song structure that are even less developed than his previous project. The album does boast an impressive guest list, but Scott’s inability to construct an engaging song in terms of structure holds them back. Even Kendrick Lamar, who possesses the ability to obliterate any artist whose music he is featured on at will, sounds like he doesn’t want to be there on “Goosebumps”. Scott and his collaborators turn the typical structure of a song upside down, and while this might work with a musician who had an ounce of their own artistry to pull this off with, Scott’s disinterested, autotuned warbling which fills these gaps does not do these songs any favours. Many of these songs lack a distinguishable hook, switching up the beat for annoying instrumental interludes or a meaningless brief shift in subject matter from Scott. This upsets the natural flow of the song. Scott also tends to let his collaborators open the track, and as many upstage him (despite weak offerings for their standards), Scott’s emergence in the latter half of the track usually bores the listener. In addition to Lamar, artists like Andre 3000 and The Weeknd are criminally misused here. Sometimes, a guest almost takes over the track with Scott serving as the worst hype man in the business. “First Take” is an absolute mess of a song, Bryson Tiller unnecessarily embellishing his notes and sounding out of sync with the beat at times while Scott adds strange colour notes and “it’s lit”s. You would think something would accidentally mesh together, but it doesn’t. Surprisingly, for a brief period in the album’s middle section, positive things begin to take shape. While still nowhere close to being mindblowing, the back to back songs “Outside” and “Goosebumps” begin to resemble a normal song structure again. These are the only songs which could actually function for me as the energetic party songs I’m sure Scott intended this entire project to be. The beat on a track like “Outside” simply hits a bit harder for some reason, and the melodies on each track are more focused and original than others. The songs additionally focus on one topic for the entire duration, for the most part. Single “Pick Up The Phone”, which has already been out for months, somehow still holds up as the project’s best song, though not because of Scott. The steel drum instrumental actually serves as a new sound for a hip-hop track, and Young Thug and Quavo’s guest verses are incredibly quotable and fun. This lends to the amazing replay value of the song which is not present anywhere else here. One wonders what might happen if Scott had anything close to the mic presence which allows Quavo to seamlessly turn “discriminize” into a word for the purposes of fitting his rhyme scheme. 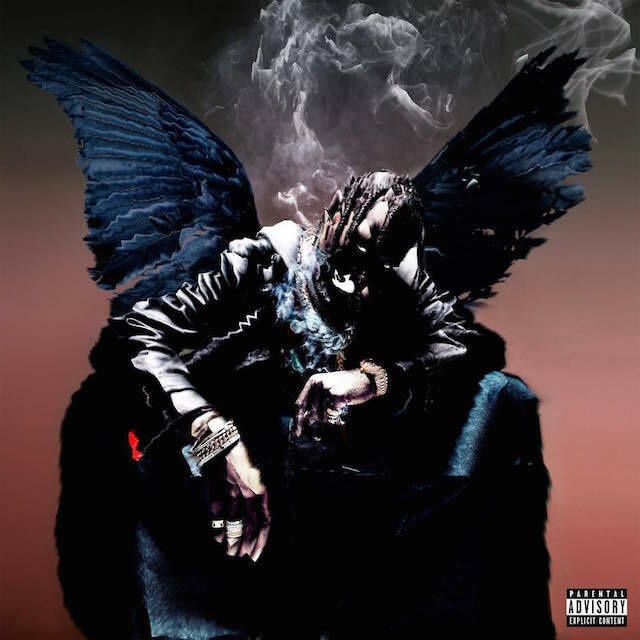 The album also suffers from a lack of originality, as Scott blatantly acknowledges his influences and incorporates elements of other people’s work in his music, whether knowingly or not. Even the title of the record was changed last minute to a standout line from Quavo’s verse in “Pick Up The Phone”. Scott has done a number of interviews proclaiming his excitement for “idol” Kid Cudi to be on his album, and while he does appear on two tracks to provide his usual brand of incoherent yelps, moans and mumbles, Scott displays his admiration by spending a quarter of his verse singing Cudi’s breakout hit “Day N Nite” on “Through The Late Night”. “Sweet Sweet” contains the same catchy melody line that made “Hotline Bling” a massive hit, although delivered without an ounce of the same goofy charisma here. “Way Back” contains obnoxiously placed samples of Kanye’s “We in the hoooussee…!” from Jay-Z’s decade-old “Roc Boys (And The Winner Is)”. “Coordinate” is basically “Panda”. The list goes on and on and on. Birds is a huge step down from Rodeo. Scott’s desire to release projects at this speed has pur a serious damper on the quality of his music in a world where Frank Ocean just took over 4 years to make his album as good as it possibly could be. An artist who is lazy enough to compile throwaways off his last album, creating some new songs in exactly the same vein to mix together, and call it a new project a year later does not deserve the high level of recognition Scott’s name currently brings. That doesn’t mean I won’t be playing “Pick Up The Phone” every time I need an energy boost, though.